At last Andrew does an honest interview. Finally checked out this podcast today and really liked it. Good work chaps. 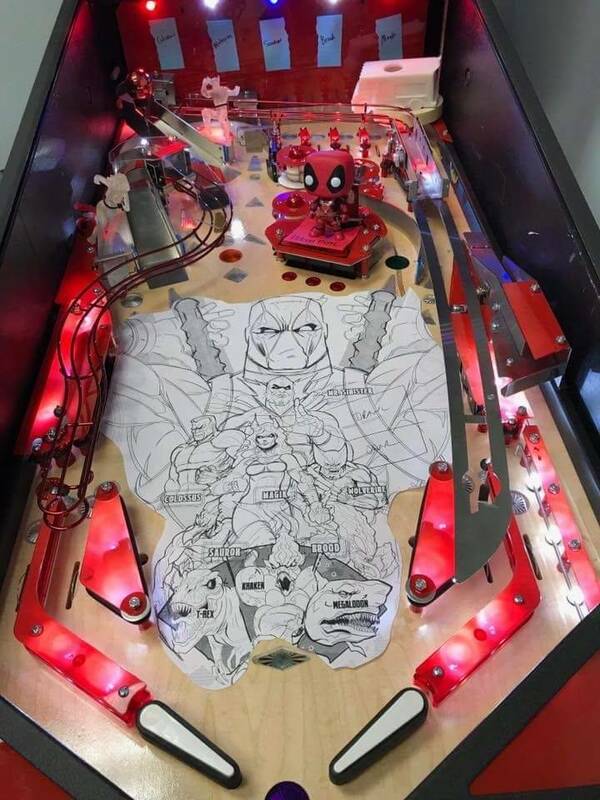 I like that you get that pinball is meant to be fun, and that a pinball podcast should be about having a laugh and not being too serious about it all! Thanks for that. We do like to have a laugh in between all the serious stuff. Glad you like. We are joined this week by Michael from AMD to give a perspective from a distributor. Plus the usual pinball news. Keith Elwin joins us for a chat about Iron Maiden, tournaments and kang sacs. Listening to this now at my desk. F'ing funny. Great Podcast guys and Elwin is the man. Keep it up, these are brilliant. Thanks Tucks. We are really enjoying doing these each week - got another interview coming up this week. Someone relatively new to pinball but in an important position that is integral to the success of a machine. Now we all know what "the sound guy" does. Josh Sharpe joins us for a very candid interview. Loved it!!! Very good stuff guys. Great interview with Josh - a funny guy. Laughing at my desk with the Yoda section. Look forward to the next one. The voice of American Pinball talks to us about Houdini and game #2. Enjoy. We hear what it's like to run a large pinball event plus we talk other stuff including predictions for the rest of the year. Love this podcast, listening now while working on a machine. Big tease of an upcoming licence from Joe Kaminkow , took over 10 years to get it and probably the first $1m licence, apparently all pinheads have always wanted it.....wonder what that is? Yep half way through EP 50. These guys are just great and love listening to them. Sly interview was epic. Everyone on here should take a listen. Really cheers up your day. Keep it up chaps! The segment on QR codes at Pintastic was interesting. I was planning to do exactly that at our NLP show last year, but organising for the comp didn't allow me time to finish developing it. I was mainly planning for the QR code to link through to some basic rules for each machine, as our show has a lot of pinball newbies.. but I had planned to also allow fault reports through the web too. But, at these prices, I am out! Unless the game play is good I won't go for beatles, not a huge theme for me. Was trying to guess what the new stern pin was going to be. I thought Beatles myself. I'm a huge fan so looking forward to it. Hopefully it has nice Magical mystery multiball. It would be funny if they had a white board version that had songs from the white album on it. Was surprised they didn't plan a deadpool pin. Seems an ideal licence for pub use. Deadpool is next Stern game!! I feel like I should win a prize ? How is this info being found out? A secret twitter account? A pinside informer? Or dodgy Dave down the pub who sells fresh fish and the odd rolex? Think just about every podcast has mentioned it, people in the know on pinside etc etc. Guessing release order is more tricky though. It’s because stern has leaks! Which is pretty sad really. I think Beatles will be at expo in October- I would expect a game announcement around end of July/Aug time frame possibly also, but success of IMDN may well mean a delay for that and thus a delay for deadpool. It's really hard to know exactly what is rumour and what is fact. Joe didn't say on or off air what the title he was referring to was however randomly talking about Paul McCartney and how popular the video was leads me to believe it's the Beatles. But again, I just don't know if it's just a bit of deflection. Almost certain Deadpool is next from stern but.....you know......see above.